What's most distinctive and troubling to the graphologist is the way Marilyn contorted certain letter formations. What of that ugly claw-like loop that she made when forming a lower zone for the y in her name? And how about that aggressive-looking final stroke on the M that stabs down, penetrating the baseline of the writing and effectively creating a very crude and ugly image of coitus. After 10 years of marriage. Gwyneth Paltrow is fielding plenty of questions about her divorce from Rocker Chris Martin. She recently explained "I had built my life on trying to be all things to all people, and I just couldn't do it anymore." Many women know a thing or two about selflessness. These are the women who stand to gain by looking at Gwyneth Paltrow's signature. I'm a funny breed of psychotherapist, insofar that I have more than a passing interest in the handwriting of my clients. People are pretty expressive of who they are, leaking their truth, in one way or another, with every gesture or inflection. The practice of graphology, a European clinical discipline, says we can even access tentative insights about people by looking at their handwriting. Gwyneth Paltrow's signature is a case in point. I initially found the signature in an essay she penned for Marlo Thomas. Thomas asked various celebrities to detail "the right words at the right time," advice or insights they received that changed their lives. Paltrow tells the story of her first boyfriend. Throughout that relationship, she was consumed with self-doubt, preoccupied by the idea that she was not good enough and couldn't hope to meet his needs. She was spiraling down when her friend, exasperated, insisted: "He is not meeting your needs!" Paltrow heard it, and ended that relationship. Now, years later, she has re-awakened to the relevance of that message. How can her signature help us understand the codependency that affects countless women? What's really notable about this signature is the degree of irregularity here. Letters bob up and down on a non-existent baseline. There is no solidity, no stability. Everything wavers. Without groundedness, the graphologist conjectures that this writer experiences anxiety, insecurity and doubt. Take a look at another signature below which looks very different. In this sample - her more 'usual' signature - there is even less solidity. The signature is placed oddly, as if it will just slide off the page. Letters lack definition and thereby fail to relay an identity. Her last name is reduced to sharp, repeating angles. I've discussed writers who use sharp angles in a post about Donald Trump. In Paltrow's signature, those angles relay a work-focused drivenness. I would conjecture a writer who sublimates anxiety, using it to fuel her many projects and agendas. But the root issue at play, I would suggest, is the source of that anxiety: an individual who has not cultivated a singular, healthy identity. And we see it in her two signatures. They are so different! It's not that one was penned carefully and one quickly. It's that the two look as if they were written by two different people. We should see some commonality, some sameness or unity between the two of them. She is a graphic chameleon; her veneer is ever-changing. In a society focused on the visual, some of us cultivate a pseudo-identity, cobbling together a self by favouring behaviours which will garner praise and attention. Without an established center, an identity that serves as an anchor in the personality, the individual runs from one project to another, from one relationship to another, and wherever she lands, finds the same barrenness, the same lack of center, that dwells within, at the root. As Simone Weil said: "to be rooted is perhaps the most important and least recognized need of the human soul." To confirm that principle, think about Marilyn Monroe's life. 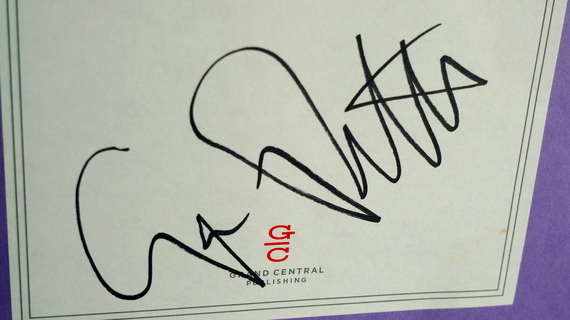 Or just look at her signature. What's most distinctive and troubling to the graphologist is the way Marilyn contorted certain letter formations. What of that ugly claw-like loop that she made when forming a lower zone for the y in her name? And how about that aggressive-looking final stroke on the M that stabs down, penetrating the baseline of the writing and effectively creating a very crude and ugly image of coitus, the line penetrating the circle, representing a compromised sexuality... ultimately leading to her demise. It was Marilyn who said, "Hollywood is a place where they'll pay you $1000 for a kiss and 50 cents for your soul." It turns out that the quest to really be somebody in the world is often pursued by those who lack self-definition, women who ultimately fall prey to the vested interests of others, depleting themselves in so doing. What can women learn from the signatures of Gwyneth Paltrow and Marilyn Monroe? The truth of the maxim, "Cultivate the root. The leaves and branches will take care of themselves." Otherwise, women may fall prey to a fate that was articulated by a pretty character in a Jane Wagner play. It was Chrissy who exclaimed, "All my life I always wanted to be somebody. But I see now I should have been more specific." This column introduces the clinical application of the psychology of handwriting, a European technique mostly unfamiliar in North America. Readers can bear in mind that graphology is appropriately used alongside other assessment methods, never used in isolation, and is properly used in the context of psychotherapy or counseling. This method is discussed fully in Clinical Graphology: An Interpretive Manual for Mental Health Practitioners, recently published by Charles C. Thomas Publishers.